Research & Innovation (R&I) teams working in industrial sciences often work on stressful, deadline-orientated projects. Being first to market is key, and the timelines are much shorter compared to other Research & Development (R&D) domains, such as the pharmaceutical industry. Assuming the product specifications are appropriate, there is still the aggressive stage-gate process to navigate. Companies need to quickly establish the cost of raw materials, identify possible large-scale production issues and assess how these factors could impact time to market. Given there will be multiple product candidates pushing for internal investment, companies need to determine where they will use strategic resources to yield the biggest return. Time to market is key in the industrial sciences market. Quite simply, if the numbers don’t add up, then there is little point in moving the product forwards. Companies also need fast access to R&I data to support external requests for product information. Integrated request management and reporting capabilities bring together all the data generated, for a given product, efficiently, that is free of errors and inaccuracies, so you’ll have solid evidence that supports your data. Data can be useless without context. E-WorkBook offers our customers the chance to build a knowledge legacy. It is well documented that companies are feeling the pressure of long-standing staff retiring, with the concurrent loss of decades of industry knowledge. R&I is a global business; companies can be running hundreds of collaborative projects at any one time. 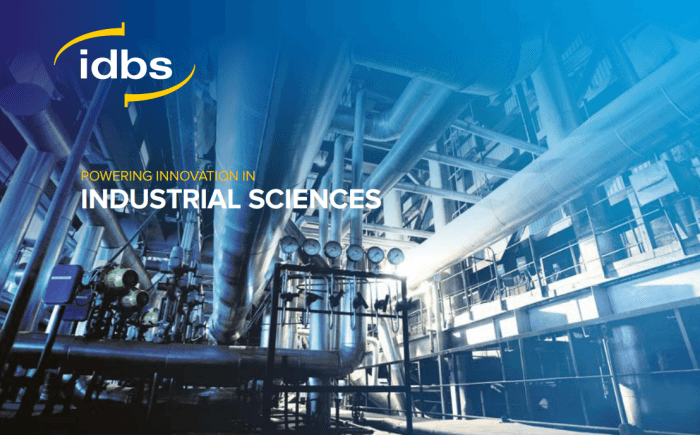 The IDBS platform provides tools to support in-line communication, process review, and global task assignment, and drive faster decision making by surfacing previously unseen data globally. The E-WorkBook Cloud can be extended further to incorporate external innovation partners and CROs. your specific data management challenges.